Craigie Aitchison preferred models for his portraits, rather than friends or family, and black models were a mainstay, because, as he said, he liked the colour. Favourite sitters included Gorgeous Macauley, who sat for some 14 years in the 1960s and ‘70s; the fashion journalist Lendel Scott-Ellis; Chicago the octogenarian former boxer; Naaotwa Swayne, the wife of a friend, composer Giles Swayne, and Comfort in the 1990s. Unlike the pale slivers of Christ in his many crucifixions, the portraits are often full-frontal and solid in presence. 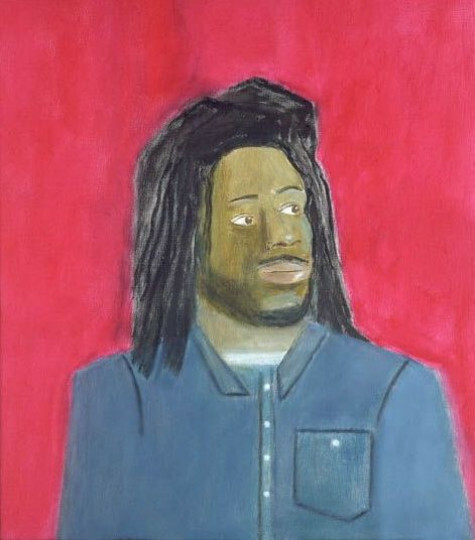 This portrait endows Chris Ogidih with the assertive clarity and serene disposition of an ancient kouros. Aitchison has defined his subject against pure colour, eliminating unnecessary information: ‘In a portrait you’re trying to get the person opposite you onto the canvas. If I could, I would trace them.’ Chris’s faded denim shirt cuts a tidy, boxy shape in against the hot raspberry background, while the shadowless outline of his shoulders and dreadlocks is as clear as a cut-out. Aitchison eschewed preliminary sketches or photographs, instead painting from life, direct onto the canvas, starting at the eyebrow. 'I started off early on with the idea that I wasn't really painting someone. I was making a mark for the eyebrow. If I got that in the right place, then I could get the other eyebrow. It was all a matter of getting marks in the right place and if you did, then it might look like the person.’ Beguilingly simple, this painting of Chris calls on a chain of references. Those twig-like eyebrows evoke the Japanese tradition of Ukiyo-e - ‘floating world’ - pictures. The paint is thin and foreground detail all the more marked for its meagerness. Buttons measure out the body with a ping; dreadlocks are draped around the face, echoing the silky coils of hair and delicately ruched garments of the onlooking angels in Piero della Francesca’s Baptism of Christ.